It might be out of the ordinary to see a spotting scope with such low power with a reticle combined. However, it’s not out of Bushnell’s league to innovate and provide the needs of those who demand such a spotting scope. The Elite Tactical LMSS spotter is on the lower end when it comes to magnification on a spotting scope. With 8-40x magnification, it might even be lower powered than your rifle scope. However, there are purposes for this platform especially when you’re combining it with a 60mm aperture. When it comes to optical quality, the spotting scope has fully multi-coated optics with ED glass and RainGuard HD. With the ED glass, you’ll have HD image quality thanks to the reduction in chromatic aberration allowing for supreme contrast, sharpness, and color fidelity along the entire field of view. It’s also very lightweight and compact for a spotting scope, again this is due to its low power abilities. A benefit of this is that it can be used free-hand on 8-12X without too much shake. You can also mount this spotter if you want more stable image quality at higher power. The reticle is a Horus H-32 measured in mils. It’s a non-illuminated reticle found in the first focal plane. Being able to use the reticle at any magnification is a huge benefit especially when the crosshairs have been lowered by 5 mils to provide an unobstructed view. It’s not a new spotting scope to the market, so it’s been around for a while. It has a low price tag that’s not seen anywhere else for the quality and the included reticle. If you’re a marksman or a hunter who appreciates a large field of view with the ability to overcome the effects of temperature conditions like mirage, this spotter is for you! What are the Benefits of Low-powered Spotting Scopes? It really depends on your needs if you prefer a high power or low power spotter. However, low power spotting scopes come with the benefit of a larger field of view, larger exit pupil, and less weight and bulk. Additionally, high-powered scopes may be prone to image distortion when viewing targets at extreme distances thanks to temperature conditions like mirage. A low-powered spotter can come down far more in magnification to still observe the image while making the conditions more manageable. Why does this Bushnell Spotting Scope have such Low Power? On top of the reasons stated above, this is also a tactical and military device. Having the ability to come down in power makes it an ideal spotter to use with other devices such as night vision scopes. It can also be used free-hand at lower magnifications similar to binoculars with 8-12x magnification without having to mount and setup everything single time you need to spot. This is also a great power range and aperture platform for sheep hunters who are in rocky terrain, on-the-go, and need a vast range of power from low (8x) to high (40x). What are the multiple Screws on the body of the spotter? These screws are placed every 90 degrees on the body of the spotter. They’re ideally placed there for mounting modular rails onto the spotting scope. With these you have the ability to attach multiple devices such as additional sights, night vision clip-ons, lights, lasers, etc. What does the Horus H32 Reticle look like? The reticle is non-illuminated, doesn’t require batteries to function, and it has no moving parts. These are benefits as it eliminates factors that are prone to failure. 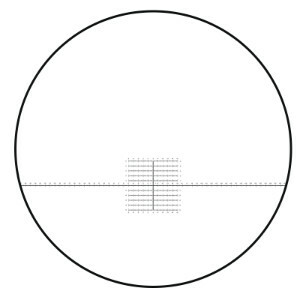 The targeting grid of the reticle is placed just below the center of the field of view by 5 mils to provide the user a larger field of view unobstructed by the crosshairs. The main hash marks are spaced 1 mil across with 1/4 mil lines across the crosshair. What does the H32 Reticle do? The windage crosshair is the mil reference line used to determine target speed and as a communication aid between the spotter and rifleman. There is also the target grid that you can use to determine target distances. Additionally, the target grid also allows for fast and accurate 2nd shot correction without making adjustments to your windage and elevation turrets. What is 2nd Shot Correction? This is a “unique non-mathematical method for the spotter to provide very accurate correctional fire data” in the event that the rifleman misses the first shot. This is a feature that Horus specializes in and owns the patent. With this type of reticle, the rifleman can get dead-on with the second shot without taking his eyes off the target or his sight picture by simply using the target grid for a new aiming point. What is this Spotting Scope for? As a tactical spotter, it can be used at the range, during competition use, and for military/combat purposes. It’s also a good scope for hunting thanks to its reticle, size, weight, and ability to use it free-hand. Where is the Bushnell LMSS spotting scope made? This spotting scope is made in Japan. The scoop on the scope is, the Bushnell Elite Tactical 8-40×60 is a versatile spotter for those who want to use it in all types of activities in various conditions. The multiple features allowing it to be used free-hand, on a tripod, as a rangefinder, speed meter, and to make 2nd shot corrections makes it a spotter worth having in your arsenal. However, if you want to up the ante a little bit with the ability to change out eyepieces on your spotter, opt with the Burris Signature HD spotting scope. It will cost you a little bit more, but you’ll have more power and aperture with the included 20-60×85 platform and a 30x eyepiece with a mil or MOA reticle. If you don’t need the ability to change out eyepieces, but you’re still after a ranging spotting scope with the lowest price tag available, the Barska WP 11-33×50 tactical spotting scope is it. It’s about as cheap and simple as you can get. In fact, we’re surprised that a ranging spotter even comes in this price range! Bushnell combines both a Horus H-32 Reticle (780841H) and military design into this LMSS spotting scope. The versatility of this spotter is definitely its best feature. If you’ve got the ranging bug, pull out your Elite Tactical and measure, shoot, and correct all at once!